I had longtime customer Tony D. group of 3 kids (high school age) onboard tonight. Conditions were fair, with North wind at 5-10mph, normal tide levels, chilly temps in the low 50's, and patchy fog/mist. Water clarity was poor tonight, and we had to move around a bunch to find any decent looking water. After 3 days of cold/windy weather, the fish were scattered, but we found some good action in areas with abundant finger mullet and glass minnows. The fish were on the feed with warming weather tonight, and most had full bellies of mullet and glass minnows. Mom and Dad set a 10pm deadline on gigging tonight for the kids to get enough rest before school on Monday, and we did our best to find fish before we had to head in. 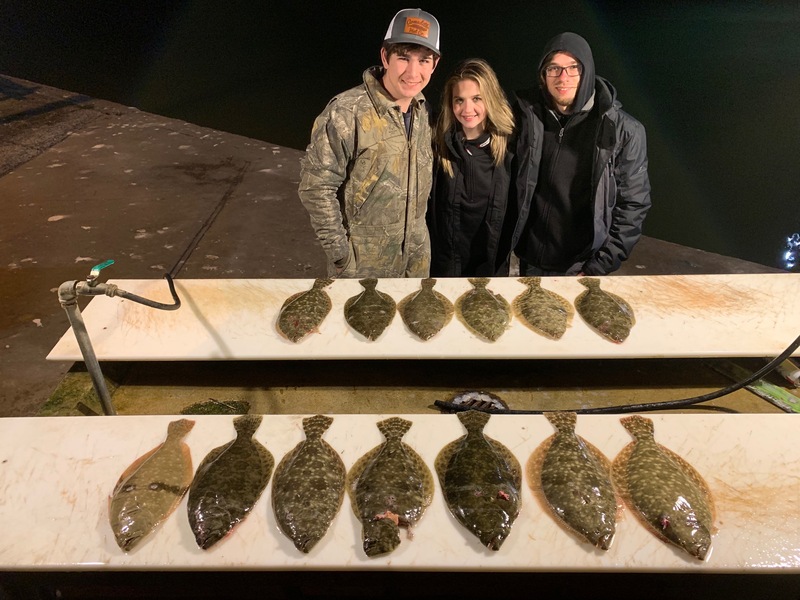 We ended with 13 flounder (2 short of a limit) by 10pm.